The latest version of HandBase for your iOS device can be purchased using your iPhone or iPad to search on the App Store. There are versions for iPhone and iPad because of the differrent screen sizes. The App Store will sense which iOS device (red arrow) you are using to access it. 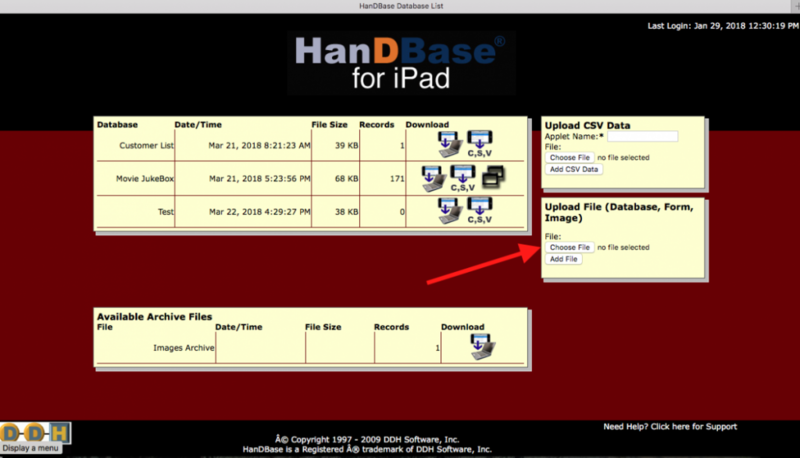 Note iOS 10.0 or later is needed to use this latest version of HanDBase, older iOS devicess like iPad2 will not work with this new HanDBase version. This app supports “Family Sharing” so one purchse will provide use on more than one iOS device if you have them (iPad and iPhone). The screen shot below does not show the price becuase I have already purchased HanDBase using the “Family Sharing” feature. 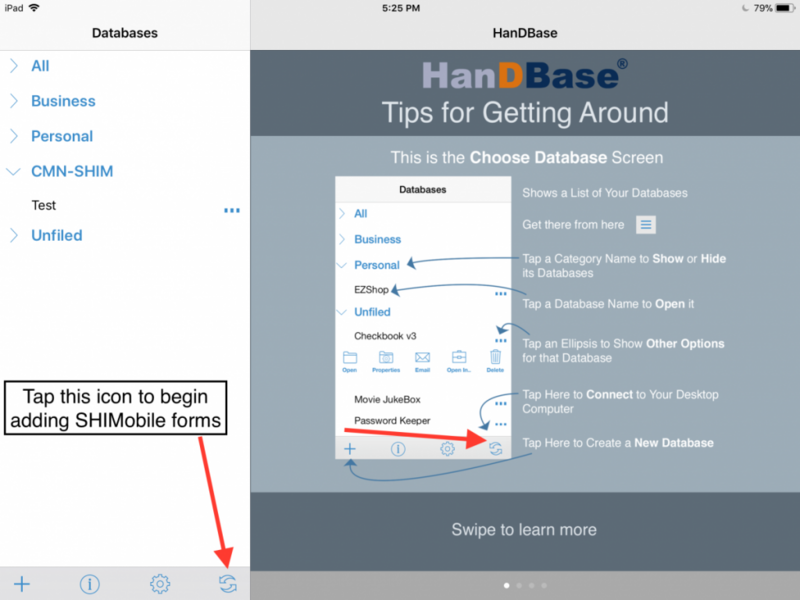 Once you have installed HanDBase for your iPad or iPhone the next step is to download the SHIMobile forms. Here is the link to get a .zip file of the SHIMobile forms SHIMobile Forms – HanDBase version from Google Drive. The image below shows where to find the “download” feature (red arrow) to get your copy of the SHIMobile forms. 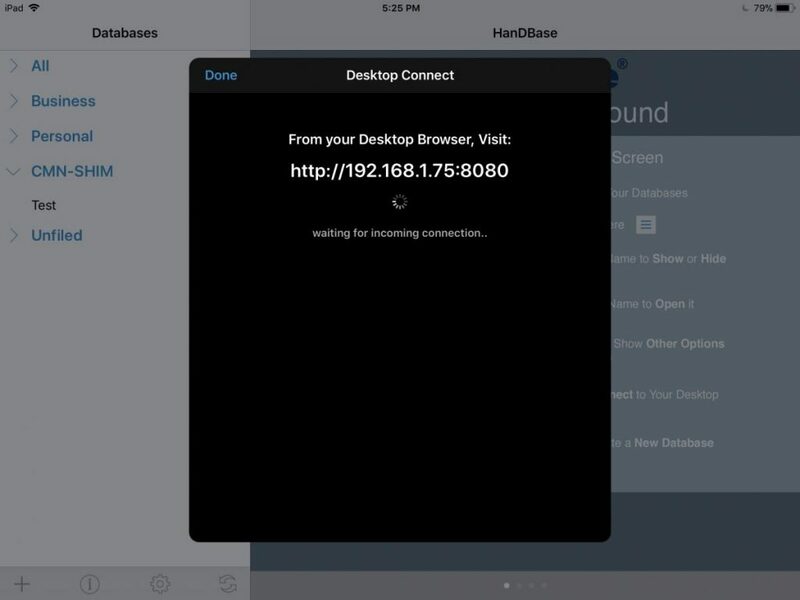 Once the zip file is on your laptop/desktop computer return to your iPhone/iPad and start HanDBase. Click the icon in the lower right of the “Databases” list when HanDBase starts. The icon is two arrows circling each other as shown in the image below (red arrow) and explained on the HanDBase home screen “Tips for Getting Around”. The Next screen on your iPhone/iPad will display a http:// address. Type that into the address bar of your web browser on your laptop or desktop computer. Your iPhone/iPad acts like a web server and if your computer and iPhone/iPad are on the same wifi network. You will see the next screen in your laptop/desktop web browser. The area to Upload the 13 database files from the .zip file you just got from Google Drive is indicated by the red arrow. You have to Upload each of the 13 database file one at a time and you will see them appear in the HanDBase “Databases” list on your iPhone/iPad and the laptop/desktop browser window you are working with. Using your laptop/desktop browser in this way is how to move data and database files and images between your mobile device and your computer. This is the laptop/desktop browser view after each of the 13 .pdb files have been uploaded to your iOS device. Stream form: The file linked here provides step by step instructions on how to use the “Stream” form. This is the first form you would use when begining a SHIMobile inventory. A link to this pdf file can also be found in the Atlas Documents section on the previous page describing SHIMobile. Many of the methods used in this form are common to all 13 of the SHIMobile forms now installed in HanDBase. The data management system for SHIMobile data is still underconstruction but email us individual files so we can post to the SHIM Atlas on the CMN.